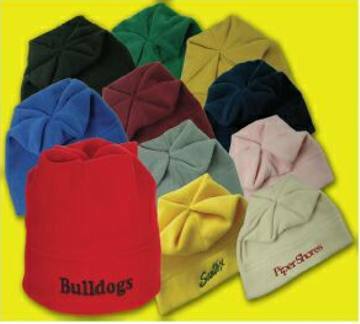 Unit prices below include up to 5,000 stitches and 9 embroidery colors on cap front. 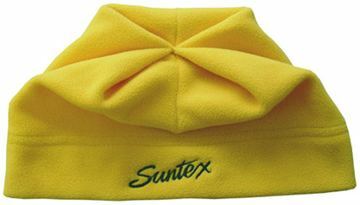 We also supply blank (not personalized) fleece beanies for omnly $2.80 each (minimum quantity: 48). Contact us for pricing above 5,000 stitches and extra embroidery locations, as well as the pricing for larger quantities. NO SET-UP CHARGES OR TAPE CHARGES! Personalized Fleece Beanie Hats in Bulk, Custom Embroidered. Promotional, Inexpensive. Budget Prices in the USA and Canada. Bulk customized beanie caps with free custom embroidery in 5000 stitches and up to 9 colors. We also supply blank (not custom embroidered) beanie caps for $2.80 per piece. Soft Plush Fleece Customized Beanie Caps at the Budget Prices in USA and Canada. No set-up charges or tape charges! American clients pay no taxes. We will send you a proof for your approval before production. Material: Soft plush poly fleece/spandex. Size: 8" top to bottom. Anti-pilling finish. Stretch material fits most sizes. 2 ply hemmed crown area (2" height). Single ply except crown area. Additional specifications : up to 5,000 stitches included in price - contact factory for cost above 5,000 stitches. Up to 9 embroidered colors.